RiverRun Cabinetry is located in the beautiful Shenandoah Valley of Virginia, where majestic mountains and rolling hills are joined by hardwood stands and new growth forests, where the light dances creating a unique sense of harmony, where a lattice of rivers and streams enrich and inspire and an appreciation for quality runs deep. In the valley, major thoroughfares mingle with country roads delivering the efficiencies of the day while preserving nature’s magnificent beauty. This has been the inspiration for RiverRun Cabinetry. Their mission is to deliver a naturally beautiful, fully featured line of cabinets where the quality reflects nature’s finest, where traditional craftsmanship and modern efficiencies come together harmoniously to create beauty and quality in a line of cabinetry that offers the very best value possible. River Run offers a 5 year limited warranty on all cabinet styles. Bridgewater Construction: Full overlay applied molding doors; all wood construction; soft close, dovetail drawers; and five piece drawer heads. Express your passion for cuisine, relax with a cup of tea, host a cookie baking party or just enjoy preparing the evening meals. The refined and sleek lines of Dalton Sable cabinetry pair with contemporary or transitional styling. Add appliances, workstation fixtures, and organizational accessories to make it all so easy and efficient. Dalton Sable Construction: Full overlay doors; all wood construction; soft close, dovetail drawers; and a classic slab drawer head or bottom drawers with five piece drawer heads. Your style – comfortable yet sophisticated. Your kitchen, a place where friends and family gather, rich with voices, cooking creativity, and the rhythm of daily living. Hampton’s linen glaze, soft white finish evokes the feeling of a French Country Kitchen. Hampton Construction: Full overlay doors; all wood construction with premium MDF painted doors; soft close, dovetail drawers; and five piece drawer heads. Realize your vision. Tap your sense of style and enthusiasm for form and function. Desoto’s white cabinetry with clean, light detailing brings a genuine spirit of openness and energy that pairs with subtle or more ornate accents. The brightness and simplicity can illuminate and inspire. It’s like a blank canvas waiting for it’s creation. Desoto Construction: Full overlay, soft close doors; all wood construction with premium MDF painted doors; soft close, dovetail drawers; and five piece drawer heads. of activity. Its soft highlights add to what makes life so rich. Lenox Construction: Full overlay applied molding doors; all wood construction; soft close, dovetail drawers; and five piece drawer heads. RiverRun Cabinetry’s Standard Construction offers many features which are considered upgrades in other lines of cabinetry. (1) Traditional face frame construction using select birch. Face frames are solid 3/4” thick with 1 1/2” stiles and rails. Mortise and tenon joints. (3) Shelves are 5/8” thick birch veneered plywood sealed with a clear-coat, adjustable and front edge banded. (4) For ease of installation, backs are framed with a 3/8” plywood hanging rail. 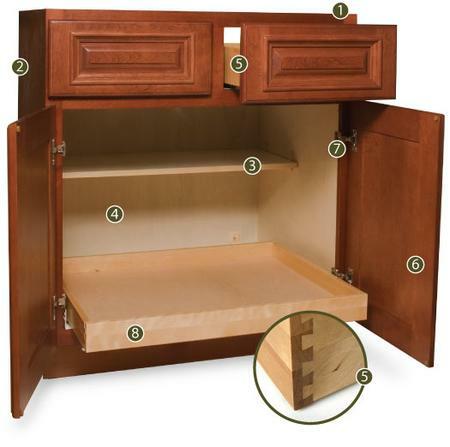 Base cabinet backs extend to the floor providing optimal structural stability. Dalton is a full overlay birch door with 2 5/8" stiles and rails. The reversed raised center panel is solid wood. (7) Hinges are 6-way adjustable. (8) Optional roll trays. All wood dovetail construction.